Your roof is constantly exposed to various weather conditions. Being subjected to rain, sun, snow, wind, and other elements can take its toll on your roof; wear may start to be a problem. 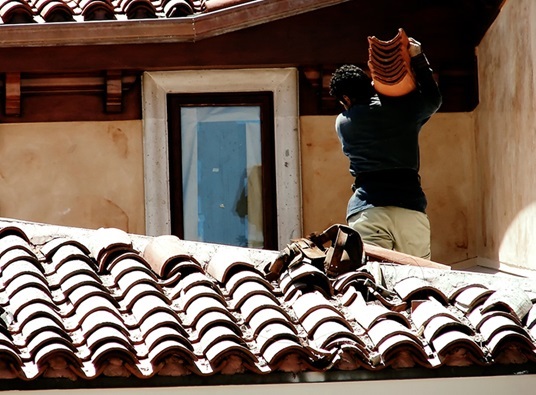 If you think your roof is damaged, do you go for roof repair or replacement? Deciding whether repairs will suffice or a new roof is necessary could be a difficult choice on your part. As a homeowner, the best way you can make an informed decision is by consulting a professional. As one of the leading roofing companies in Northwest Indiana, Rogers Roofing can provide you with the assistance you need. Our help begins with a thorough assessment of your roof’s current condition. 1. Excess granule loss – This is a sign that your shingles have reached the end of their service life. Once this happens, your roof may not protect your home effectively against the weather. 2. A wide area of missing or curling shingles – Severe weather conditions, like heavy winds, can cause missing or curling shingles. Extreme heat and moisture could also be a reason for curling. 3. Flashing damage – Damage to the metal covering roof protrusions like the chimney is a common cause of roof leaks. This is a sign your roof might be damaged by rain, wind, and ice. 4. Moss and algae growth – If moss and algae are growing on the surface of your roof, it can hasten the deterioration of your roof. Rogers Roofing is a fully licensed, insured and bonded company, and our roofers in Northwest Indiana are trained to handle various roofing and home improvement needs. We are also fully bonded and insured to protect both our workers and your property. Rest assured that your financial interests are protected in the event of an injury or property damage. As licensed professionals, we can provide accurate recommendations on what the best course of action is. Once we inspect your roof, we will find the right solution that fit your roof’s condition. Learn more about whether you should repair or replace your roof by giving Rogers Roofing a call today.